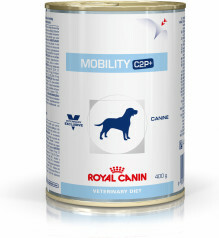 Mobility C2P+ For supporting dogs with mobility or after orthopaedic surgery or trauma. Exceptional palatability encourages healthy food intakes and the daily integration of nutritional management as part of a multimodal approach for dogs with mobility issues. Maize flour, dehydrated poultry protein, maize, rice, animal fats, vegetable fibres, hydrolysed animal proteins, wheat, maize gluten, fish oil, beet pulp, wheat gluten*, hydrolysed collagen (1.5%), minerals, marigold extract (source of lutein). Crude ash: 5.8%. Crude fibre: 3.9%. Crude oil fats: 12%. Moisture: 9.5%. Protein: 25%. Vitamin A: 15500IU, Vitamin D3: 1000IU, E1 (Iron): 40mg, E2 (Iodine): 4mg, E4 (Copper): 12mg, E5 (Manganese): 51mg, E6 (Zinc): 154mg, E8 (Selenium): 0.1mg. Preservatives - Antioxidants. Clinoptilolite of sedimentary origin: 10g. Green tea extract (source of polyphenols): 3.1g, turmeric extract (Curcuma Longa L): 1.6g. Preservatives - Antioxidants.